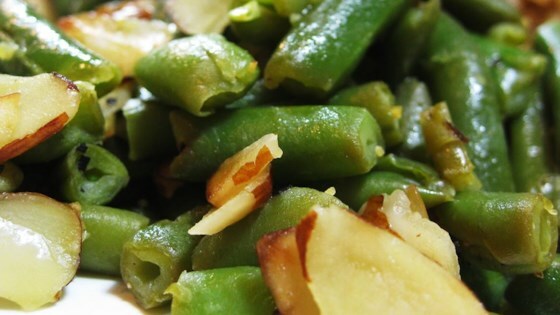 "These green beans are easy and delicious. They are a bit tangy, spicy, and crunchy with the almonds. My family's favorite!" Meanwhile, melt butter in a skillet over medium heat. Saute almonds until lightly browned. Season with lemon pepper. Stir in green beans, and toss to coat. Sounds too simple. But I got raves at all my Holiday dinners for them. The kids even had seconds (which was really weird). Works with frozen petite beans as well as blanched fresh ones. If you're a fan of lemon pepper (which I happen to be), these are for you! Very tasty, thanks Annette! I also used frozen green beans that I microwaved beforehand. Very easy, great-tasting recipe.